TBP (Pretoria, South Africa) – Real gross domestic product (GDP) growth slowed to 1.9% in 2013 from 2.5% in 2012 and 3.6% in 2011 according to Statistics South Africa data released on February 25. The Organisation for Economic Cooperation and Development (OECD) said in its March 2013 review of South Africa that the country is advancing, but failing to fully achieve its considerable potential. Per capita incomes are growing, public services are expanding, health indicators are improving, crime rates are falling and demographic trends are favourable, said its report. The public finances are in better shape than those of many OECD countries, the financial system is healthy and core inflation is stable and within the South Africa Reserve Bank’s inflation target zone. The OECD forecast GDP growth of 2.8% in 2013 and 3.8% in 2014. However, Barclays Research economists Miyelani Maluleke and Peter Worthington said the 2014 growth outlook remains clouded and they do not expect a strong acceleration in GDP growth just yet. On the production side, the mining sector started 2014 on a sour note with a strike at the three major platinum producing companies. Although the mining companies have indicated that they have stockpiles of ore and concentrate that will allow them to keep producing ounces for eight weeks, the impact has already been felt with companies reporting R5 billion in lost revenues. 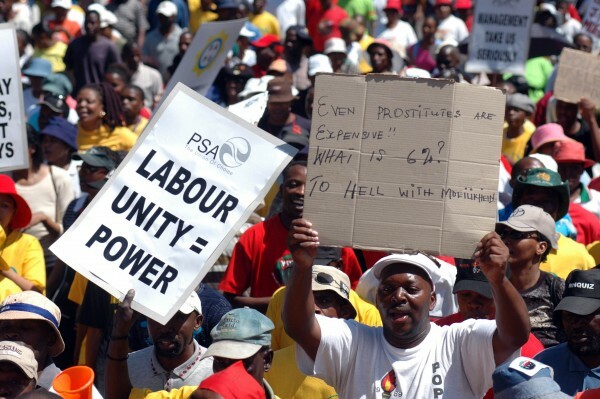 The strike, which started on 23 January, could begin to pose an even bigger downside threat to GDP if it remains unresolved by the time the stockpiles run out. In the manufacturing sector, there has certainly been a rebound in the fourth quarter due to base effects, but the sector has thus far not shown a strong response to the more competitive currency. The January manufacturing PMI printed at 49.9, suggesting a soft start to the year in the manufacturing sector. Additionally, power utility Eskom has recently reported that the national electricity system is under severe strain and has indicated that it could require its industrial clients to cut electricity by 10% as per its emergency agreements. This would be a direct hit to output, particularly in mining and manufacturing. There is no major electricity generation capacity expected to come on-stream until at least the end of the year. Hence, electricity will remain a key binding constraint this year and a downside risk to growth. HSBC economist David Faulkner said he expected 2014 to be characterized by a marked slowdown in domestic demand, which will result in another year of sluggish growth for the South African economy. HSBC now expects GDP growth to be 1.8% in 2014 and 2.7% in 2015 from 2.6% and 3.1% previously as household consumption slows sharply and investment stalls. The weakening in domestic demand drivers remain evident in slowing service sector growth. Despite the pick-up in growth to 3.8% q/q seasonally adjusted and annualised from 0.7% in the third quarter, the South African economy remains in the shadow of anaemic growth and downside growth risks. The external environment, which combines US Federal Reserve bond buying tapering, renewed China slowdown concerns, and a range of emerging market crises, will add further headwinds to growth and challenges to the country’s macroeconomic policy makers. Capital Economics economist Shilan Shah said that despite the acceleration in growth in the fourth quarter, on an annual basis, the South African economy grew at its second slowest pace in 15 years in 2013. Looking ahead, a number of domestic and external constraints suggest that growth will remain lacklustre in 2014 and 2015. To compound matters, a pick-up in inflation means that monetary policy is likely to be tightened further over the coming months, despite the weakness of the economy. Capital Economics are therefore forecasting full-year GDP growth of 2.3% in 2014 and 2.5% in 2015. This leaves them at the bottom end of consensus expectations, which is forecasting a growth of 2.6% in 2014 and 3.2% in 2015.